Tuffy can’t wait for Ellie’s family to go away on holiday. A week of freedom lies ahead – if only he can escape the catsitter. But things go terribly wrong when Tuffy is catapulted into the arms of sweet-as-pie neighbour Melanie, who has always longed for a cuddly ickle pussykins. Dressed up in baby clothes, drinking cream and pampered like a pussycat, Tuffy soon loses all his dignity. Has our cruel Killer Cat really gone for good? Or can he use his killer instincts to strike back? at the beggineng the cat messed up.fella huged the cat becase fella was going somewhere. at the end he sat on the floor comfotbley. in chapter 3 bella was a littile bit weird because she sang beooooooooooooooooooo-ootiful dreeeeamer and tiger sang orleeeeeeeee-eeeans. in the middle he was cheeky. in chapter 9 in the middle he was embarresed. in the end he was so ennoyed so he fightied whith everyone. in chapetter 10 mealine said thats not a cat thats a pig. the charecters are mealine,tiger and fella. 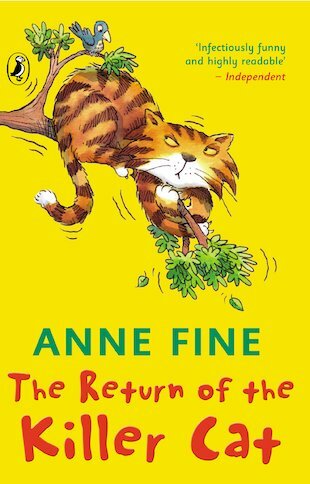 ‘Return of the Killer Cat’ is the sequel to ‘Diary of the Killer Cat’. Another book full of laughs to split your sides. A good read.